While Intel’s other 5GHz processor has turned out to be greatly exaggerated, Intel’s original 5GHz chip, the Coffee Lake-based Core i7-8086K, is very much real. And right on schedule, Intel has rolled it out to retail. As unexpectedly published in the Intel 8086K giveaway terms & conditions, the retail price on the chip is indeed $425. This makes for what’s essentially a $75 premium over Intel’s once and future king, the Core i7-8700K. 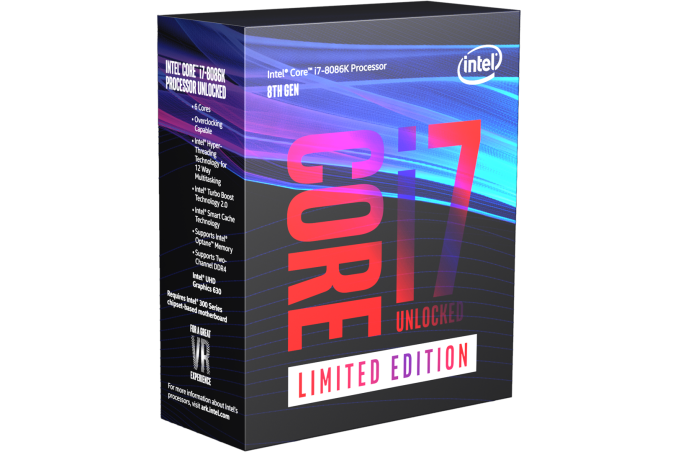 As a reminder only 50,000 units of the 8086K are being released – minus 8,086 for the giveaway – so while this is technically Intel’s fastest 6-core CPU, it isn’t going to be a permanent fixture like the 8700K. While we’re still waiting to get the individual per-core turbo levels of Intel’s special edition chip, officially its base clock and single-core turbo clock are both 300MHz higher than the 8700K, or about 6-8% faster than its non-special counterpart. And we expect the other turbo levels to be similar. Ostensibly the TDP remains at 95W, however as Intel defines this as power consumption under load at the base clock, power consumption with turbo – particularly multi-core enhancement, which I know you’re all going to run anyhow – will definitely be higher. The CPU is available from Amazon, Newegg, and a few other retailers while supplies last. So this is a "5GHz chip" without Intel actually announcing individual per-core turbo levels? Technically one single core could run at 5GHz at any time but we're touting it as a 5GHz chip? I'm not sure why you would buy this over a delidded and binned 8700k? silicon lottery has a 5.0ghz stable 8700k for $419. Exactly. If people really go crazy for this special, limited edition, the best thing might be to leave it in the sealed box and resell it a a premium, just like some action figures.